Their name comes from the Hindi word Kora meaning coarse cloth and it refers to their local traditional work of weaving that type of cloth. They are a Scheduled Caste, which means they have low, but not the lowest status among Hindu peoples. 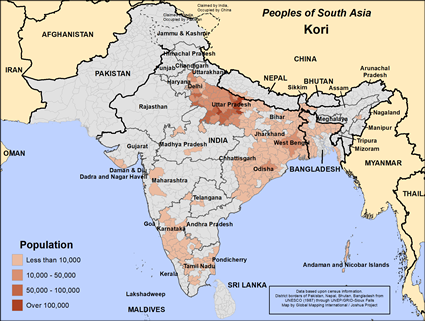 The Kori live mainly in India's states of Uttar Pradesh, Maharashtra, Madhya Pradesh and Odisha, but a small number live in Bangladesh. The Kori have a low social standing and are not well off financially. They are often mocked because they are weavers. Some Kori families use power looms. Some with land are farmers but many are landless and work as laborers. As Hindus, they do not eat beef but they do eat chicken, mutton, pork and eggs. They eat wheat, rice, dairy produce, fruits in season and vegetables. They drink alcohol. They have low literacy levels, so the gospel would need to be given in oral form. Most of the Kori do not use banks but use moneylenders and shopkeepers. The Kori are endogamous, which means they do not normally marry outside their group. They have adult marriages that are arranged by the elders of both families. They allow for divorce. Divorcees and the bereaved can remarry. Sons inherit the property of the father and the oldest son becomes in charge of the home. Women do the housework and help with weaving and agriculture. 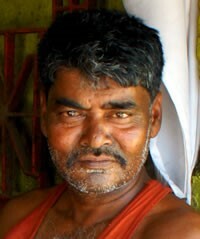 The Kori have caste councils who judge things like adultery and divorce. Fines are the usual punishment with excommunication being the last resort. The Kori are Hindus and worship all the Hindu gods and goddesses along with community gods. They take part in the major Hindu festivals. Brahmin priests perform their birth, marriage and death rituals. They cremate the dead but bury them if they died either by leprosy or suicide. Like other peoples in Bangladesh, the Kori people need the opportunity to find truth, love, blessing, and salvation in Jesus Christ. * Pray for gospel workers to catch a vision for reaching the Kori people for Jesus and that in God's sovereign timing the hearts of the Kori people would be open and ready to follow him. * Pray for the spiritual lives of the Kori people to become fruitful as they follow Christ. * We pray for the lives and culture of the Kori people to evidence the rule and reign of the Kingdom of God as they open to the gospel, and for the beauty of Jesus to be seen in them. * Pray for the Holy Spirit to give the Kori people teachable and understanding hearts. https://joshuaproject.net/people_groups/17263/INView Kori in all countries.